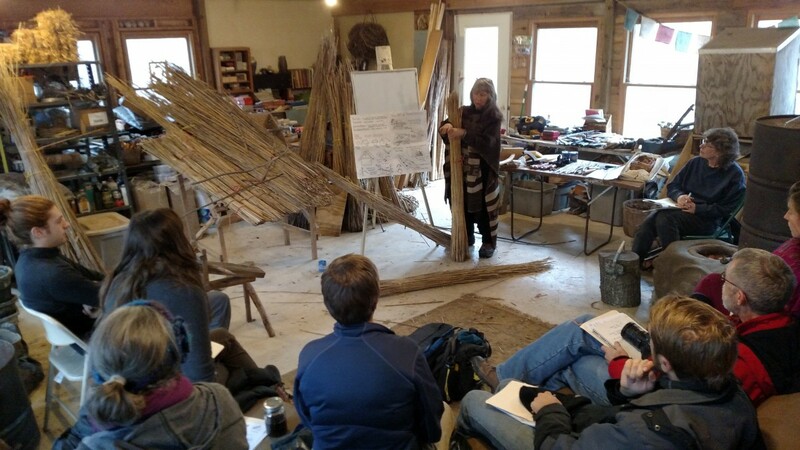 On Saturday January 10th, in the comfortably cold winter woods of Oxford, Michigan, six workshop attendees traveled long and far, from Howell, Goodrich, and even internationally from Ontario, and all arrived to the warm welcome of Strawbale Studio’s 2016 Wintership crew: seven “Winterns” guided patiently and joyful by Deanne. 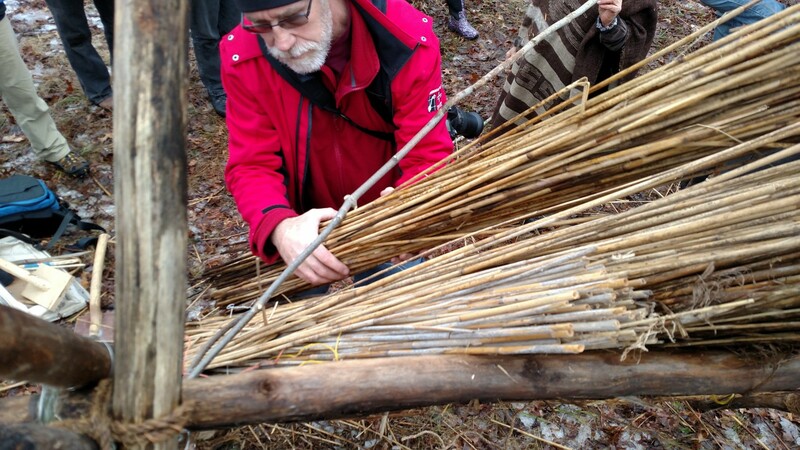 It was the first of the weekend workshops in January and the topic was everything Thatching! Motivations for learning were quite varied, but most all of us were greenhorns when it came to thatched roofs. Brian and Heather came from Howell Recreation Center to explore options to re-thatch a hut in their houses of the world exhibit. Mary came from Ontario hoping to reignite some energy to finish a small thatched roof project. 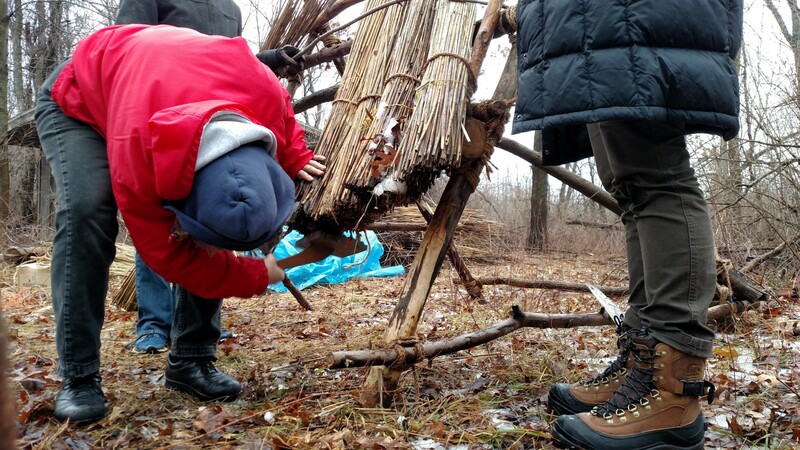 Though many of us didn’t have particular projects in mind, we were enthused to learn a craft that could meet the universal need for putting a roof over one’s head. After introductions and delicious snacks in the rocket stove warmed Red Shed, Deanne gave an overview that loosely followed these topics, at least as far as my notes go: roof function, roof designs, reed quality and selection, advantages and disadvantages to thatched roofs, and thatching tools. Thatching is described as any roof made of plant materials, so this largely depends on the climate and plant availability; materials include using palm, grasses, reed, sticks, or moss. Generally, the material selected will be used for shedding away water and insulating a structure to be cool in the summer or warm in the winter. The material that is abundant in this area and used on many roofs here is called Phragmites, also known as water reed. Phragmites is invasive to this area and outgrow native plants including the cattail. Phragmites is pervasive throughout the region, so finding it isn’t hard, but harvesting good quality reed is more of a challenge. Firstly, it is important to select reed with consistent size, shape, straightness, bright color, and compression and tensile strength. It is common to find Phragmites up to 12 feet tall, but harvesting reed that is four to six feet, small diameter, and not too gray due to drying or mold is ideal. A reed thatched roof has many advantages. As mentioned, the materials can be harvested locally with no cost. The aesthetic appeal of a nicely thatched roof is quite becoming and it isn’t uncommon to expect to see some Hobbits scurrying about. In Michigan cold winters, the thick thatched roof provides great insulation and can last twice as long as modern roofs up to 50 years. 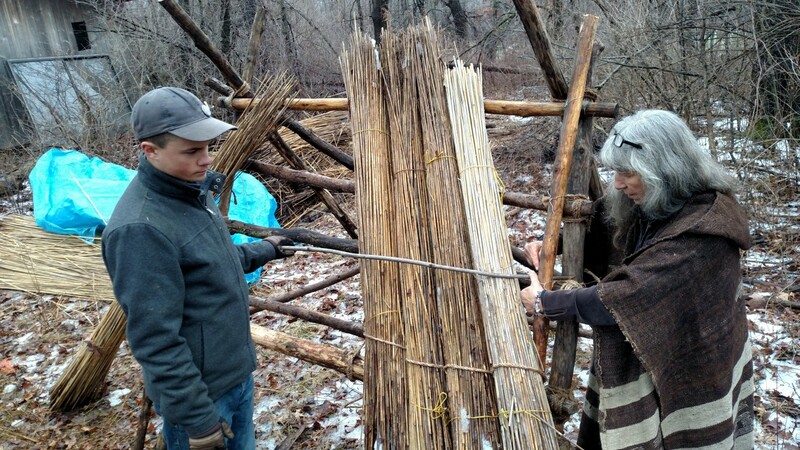 However, there’s always a downside; harvesting reed is quite labor intensive, taking about 30 minutes per bundle, and requiring roughly one bundle per one square-foot of the structure’s footprint. 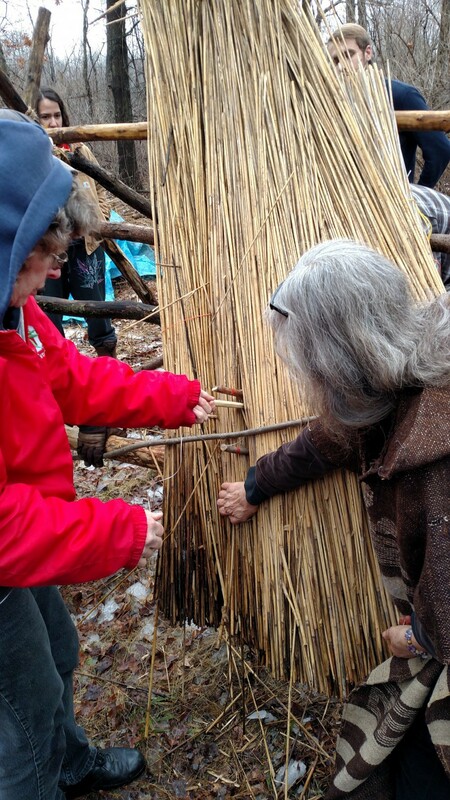 Yet, to quote Deanne directly from this day, “My goal is to connect with nature; not just to be efficient.” There’s also potential for fire hazard, but with proper sealing with cob or other materials, the thatched roof is similar to wooden shingled roofs. Harvesting also generally needs to happen in the winters, when the reed has died and the wetlands are accessibly frozen over. Thatching and reed collecting have a handful of common and particular tools for the trade. Some are shown in the Art of Thatching picture above. 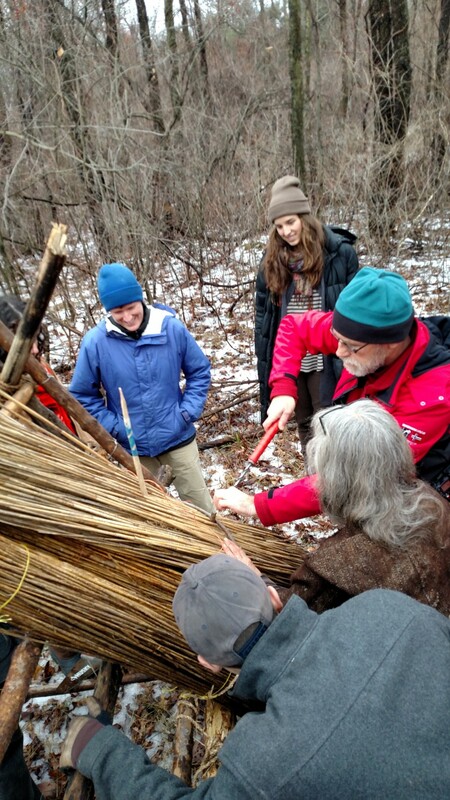 Following the overview, Deanne did a half-scale thatching demonstration inside the red shed. 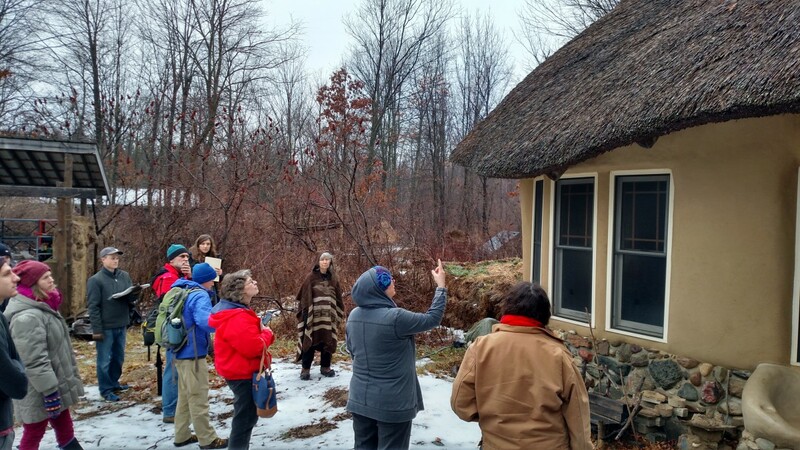 Then we meandered outside to observe the Kid’s Cottage, Strawbale Studio, and a few smaller structures to review the thatched roof in completed projects. 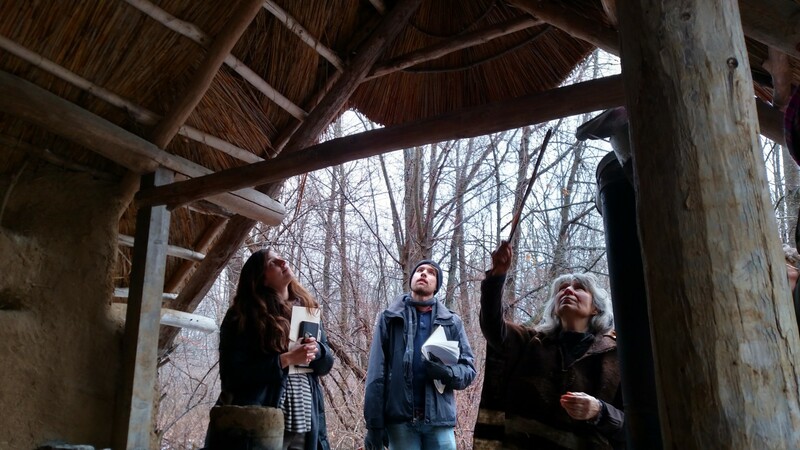 Deanne, Alison, and Jacob making observations on the Kid’s Cottage’s thatched roof. Deanne sitting on and demonstrating the draw horse. 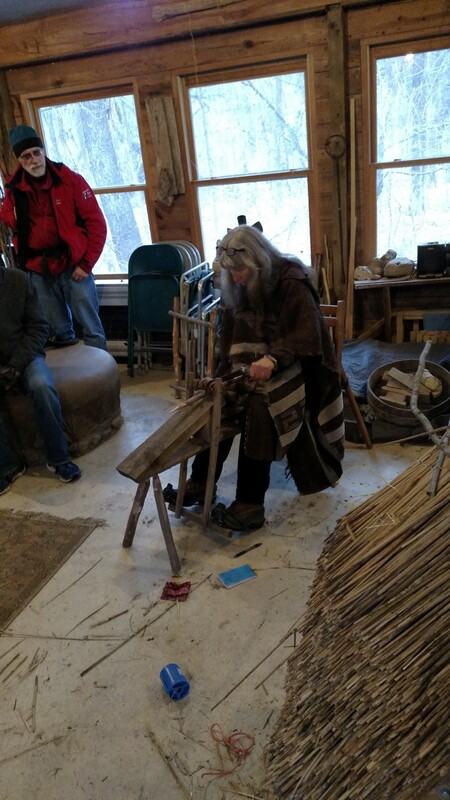 Her right foot is pushing on the fulcrum to pinch the wood into place as she works on it. 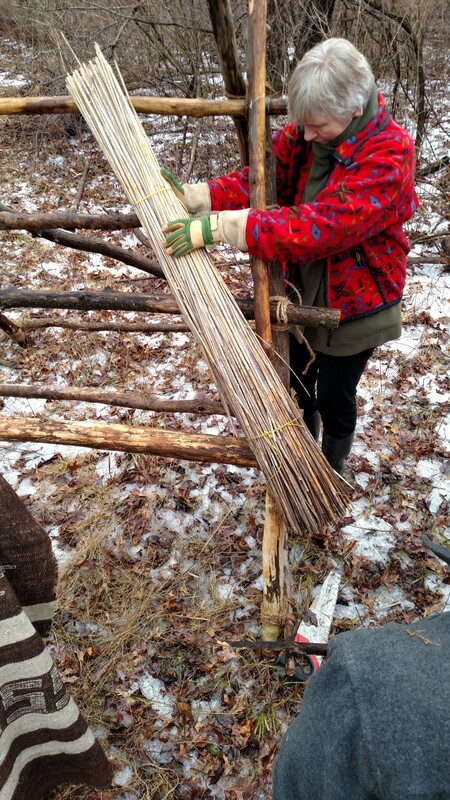 Mary is placing the first of the base row bundles at an angle on the A-frame so that the end hangs over the eave corner. 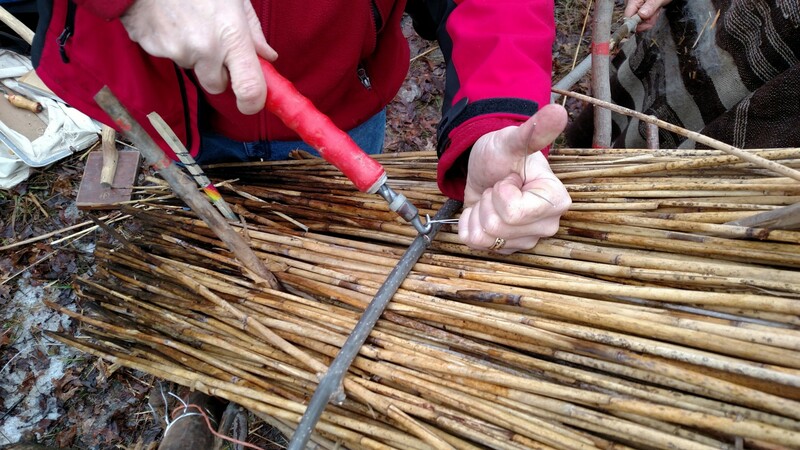 Hands on with thatching using the ratcheting tool to twist the wire, aka “Nurse Ratchet”. The wire attaches the first base layer bundle at an angle over the eave/edge corner to the purlin (batton) cross post on the frame. 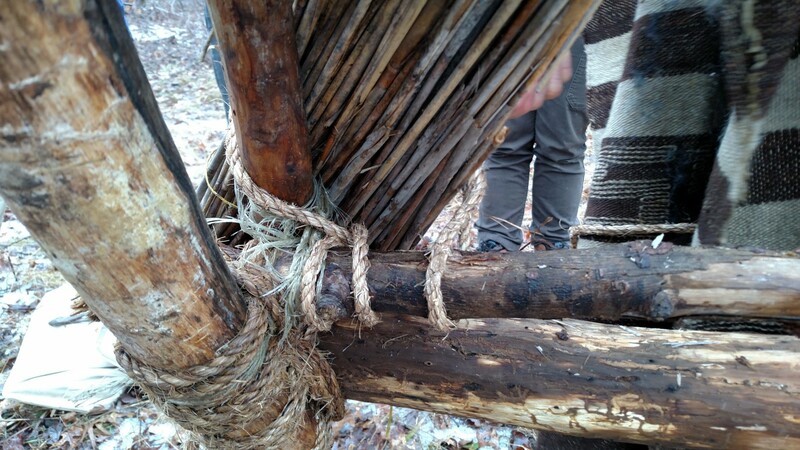 A heavy Manilla rope (light brown color) tied with a clove hitch to the purlin, continues around the base reed bundle row with half-hitches to hold each bundle tightly in place. 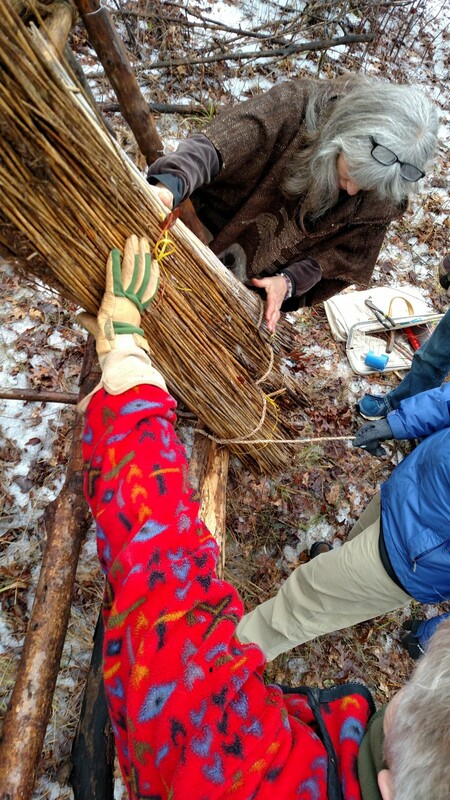 Mary, Deanne, and Heather are seen here tying the base row bundles with manilla rope and a half hitch around the bottom purlin. Lynn shaping the base layer reed overhang with the Leggett. Casey and Deanne are attaching the sway to the purlin on the A-frame. The sway will lock down the first row of loose reed that goes over the base layer shown here. All smiles when the ratcheting tool, aka “Nurse Ratchet”, is in use. Lynn and Deanne are fastening the sway over the loose reeds. 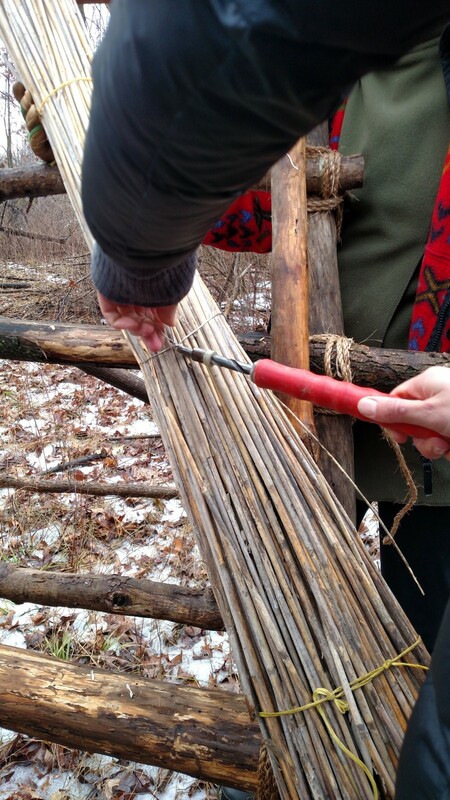 The wooden needle is used to thread through the reed, under the frame’s purlin below, and then over the sway. Alison is deep in thought as Deanne shows that the reed will need to be tapped up to about a hand width from the bottom of the frame. The Leggett in her hand will be used to tap up the reed ends. Lynn using the horizontal reed “legget” to tap up the reed ends into consistent slope and shape. 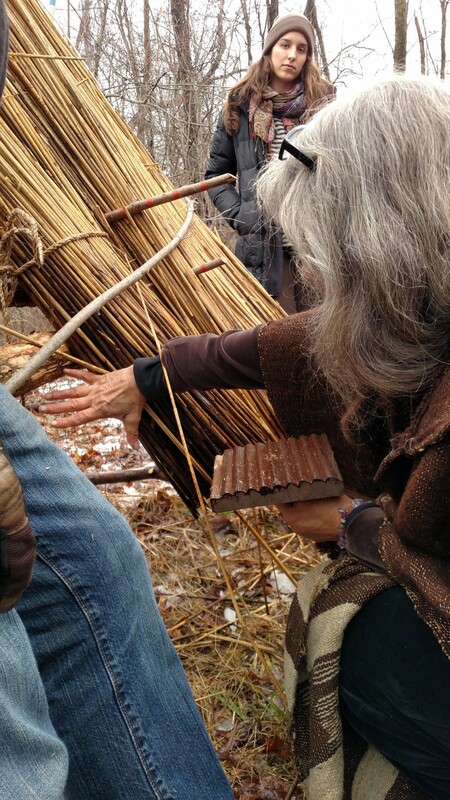 Petar looks on as Deanne shows us how the pin is used to hold the loose red in place and the wooden needle will be used to tie the sway (the gray stick across the reed) down to the purlin under the reed bundles. 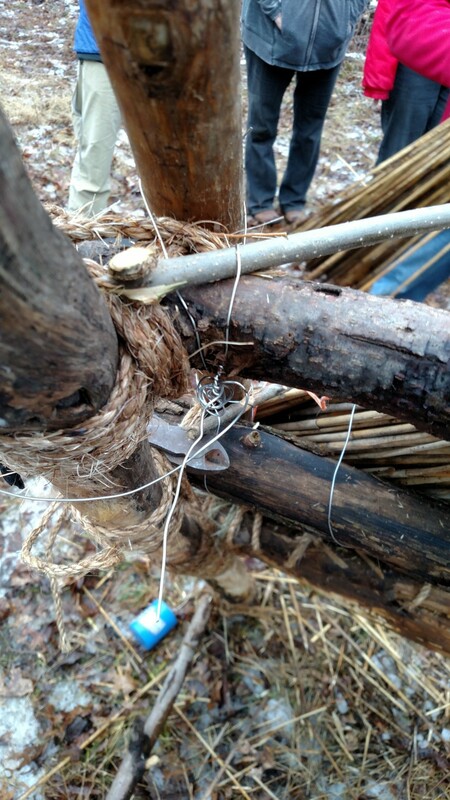 Brian is thumbs up for using the ratcheting tool to twist the wire and fasten the sway down over the reed. The interior of the ratcheting tool is similar to a drill bit, and when the red end is pulled, the metal hook end rotates. 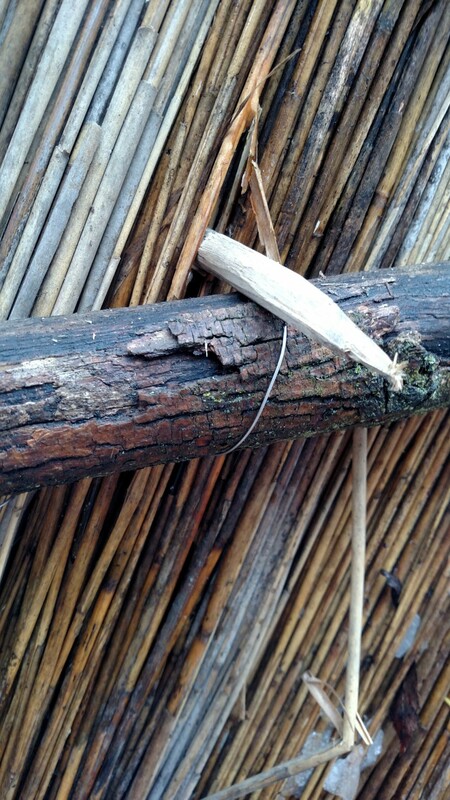 This is underneath the reeds; the larger wood stick is the purlin (batton) on the frame. The sharp pointed guide “pin” is pushed through the reed as a reference to the top of the purlin underneath. A wooden needle (not shown) has already gone through the reed from outside, under the purlin, and up over the purlin along the guide pin. The wire is fastened on the outside. 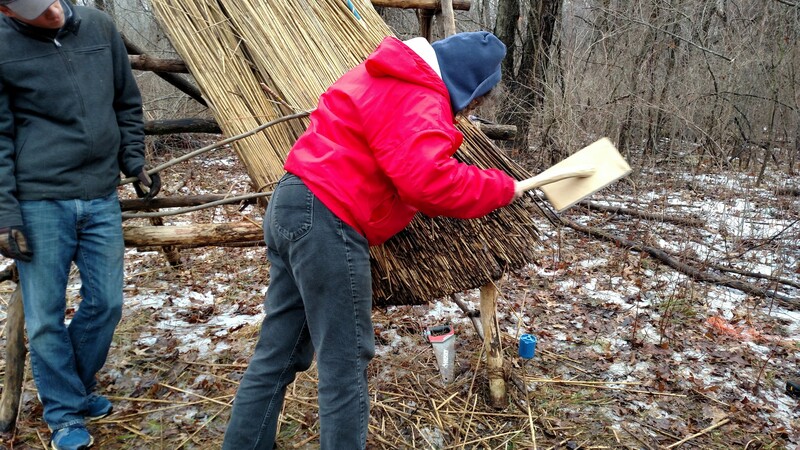 Brian from Howell Recreation Center is rolling another reed bundle in over the base row of bundles, and under the sway (gray stick). The sway (gray branch) is fastened on the inside of the frame. 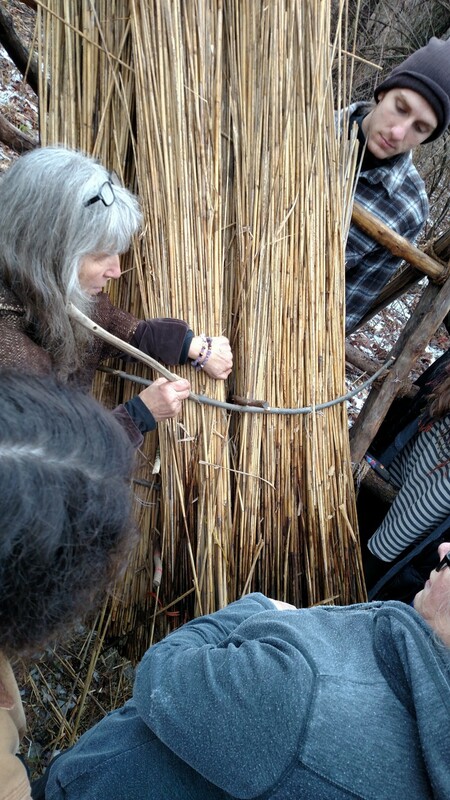 Sunday was slated to be a field trip to the reed field to learn harvesting reed bundles. However, an ice storm coated the reed with freezing rain, and plans changed to a delightful indoor discussion on Canadian and United States’ politics and the state of the world. Always something to learn, everyone brings something interesting to the table!